Religious Judaic Jewelry - This is a modern sterling silver mezuzah pendant with a printed parchment inside and Shadai written in Hebrew on the front. This beautiful necklace is medium size and comes with an 18" sterling silver Figaro chain. This charm is also available in 14K yellow gold. 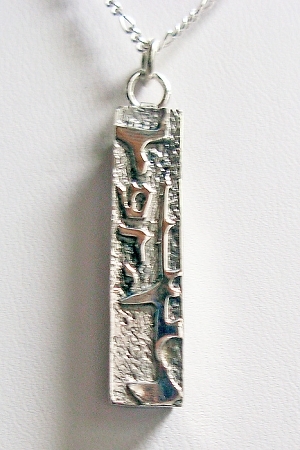 Handcrafted Sterling Silver Mezuzah with parchment and 18" sterling Silver figaro chain.